Original Samsung Tab S 10.5 complete replacement screen in bronze. 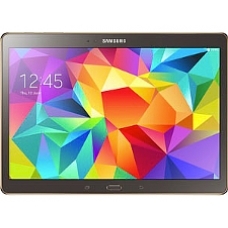 This genuine original bronze Samsung Tab S screen comes complete with the LCD and touch screen, if you have broken your LCD or glass touch screen or both this is the correct black Samsung part, this complete screen makes replacement of the display on your Samsung Tab S 10.5 simple and straight forward. These are genuine and original Samsung Tab S 10.5 complete displays. * For All Samsung Tab S 10.5 Models. * Please Note the Screen does not come with a Home Button. If you are not confident with fitting this black Samsung Tab S 10.5 screen part yourself, just follow the link below and order the in-house Samsung screen repair service.